Ephesus is one of the world's most magnificent restored archeological sites of antiquity. You will enjoy privately guided Ephesus Tours, walking along the marble paving, almost hear the steps of marching Roman legions or the ardent preaching of St. Paul addressing the Ephesians. 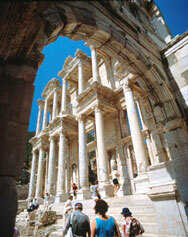 You may choose the Ephesus Tours options among the various alternatives.